Logging into your favourite web services could soon be as easy as looking at, and speaking to, your phone. Face and voice recognition technology has been developed that could do away with having to type in passwords on fiddly little keyboards. I stopped by the University of Manchester, UK yesterday to meet the people developing it. 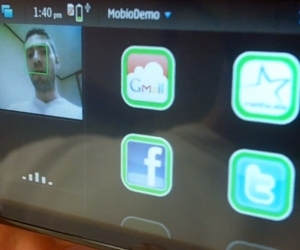 As part of the European MoBio (mobile biometry) Project, the Manchester team has developed a demo app that can log the user into Gmail, Twitter and Facebook using just face and voice recognition. Work on the technology finishes this month and Dr Philip A. Tresadern says that a number of well-known companies in the mobile space have shown interest in using the technology. Although the demo has been built for the Nokia N900, Dr Tresadern says that he may well have opted for the iPhone if the front-facing camera-sporting iPhone 4 had been released in time. Forget Apple’s Facetime, this seems like the perfect use for a front-facing camera. If your smartphone is stolen, the thief potentially has access to not only any photos, video and music stored on it, but also your email, Twitter account and other social media profiles. Protecting all of that with something more secure than a password makes sense, and this technology could well be the solution. Dr Tresadern says that it won’t be fooled by a photograph of your face, either. “We can easily make it check for movements like the eys blinking”. It also has potential as a way of integrating XBox Kinect-style features into mobile phone games. Here’s Dr Tresadern showing how he can log into Twitter using the technology. It’s also worth checking out this older video which swept the Internet earlier this year which shows how the phone can track different parts of the face. Read next: Can London's Tech City really rival Silicon Valley?